The Rebel Sweetheart. 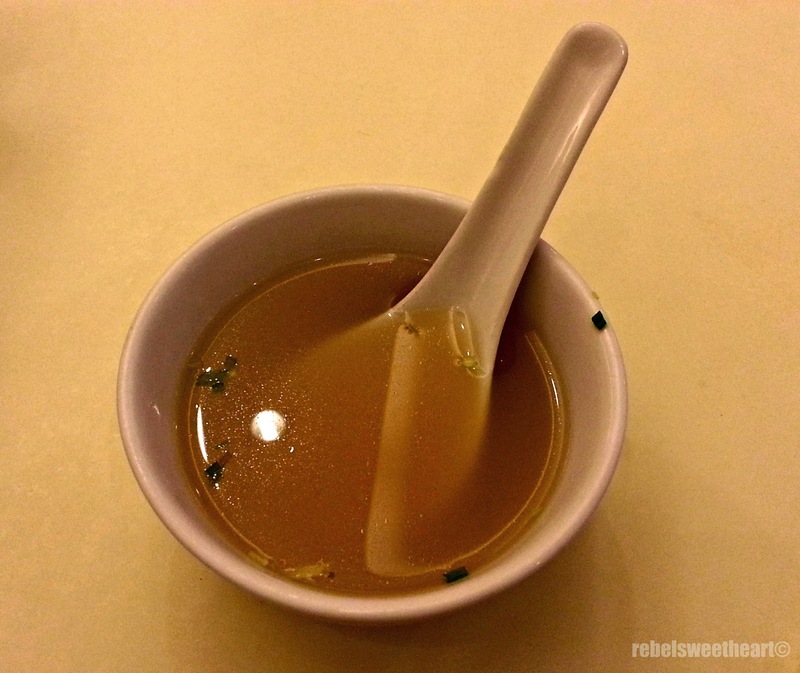 : Foodie Goodie | Hap Chan Restaurant. It's our anniversary today! Can't believe my husband and I have been together for 11 long years already. And to celebrate the occasion (despite the husband's physical absence since he's still working overseas), we decided (and by we I mean my son and I) to have lunch at Hap Chan Restaurant. 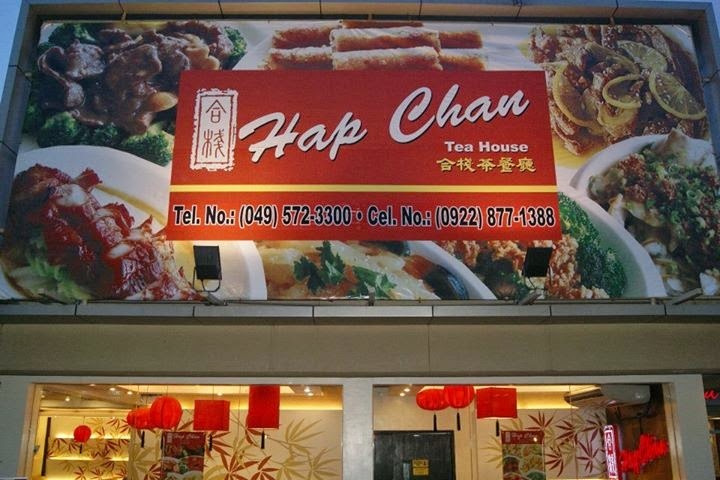 Oh yes, we actually have Hap Chan in San Pablo City. The branch is located at Ultimart, the very first mall here in my hometown. The little man and I arrived at the restaurant around 2 pm. A crowd of ten people had just finished eating and was about to leave the restaurant as we stepped in. And within minutes, Yue and I had the place all to ourselves. 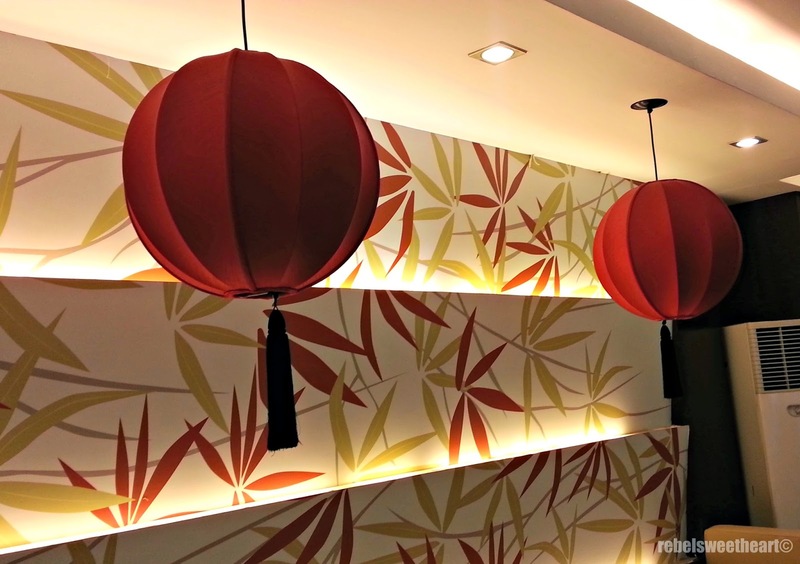 You get an Asian vibe from the lighting and fixtures - after all, this is a Chinese restaurant. Bamboo mural and red lanterns. 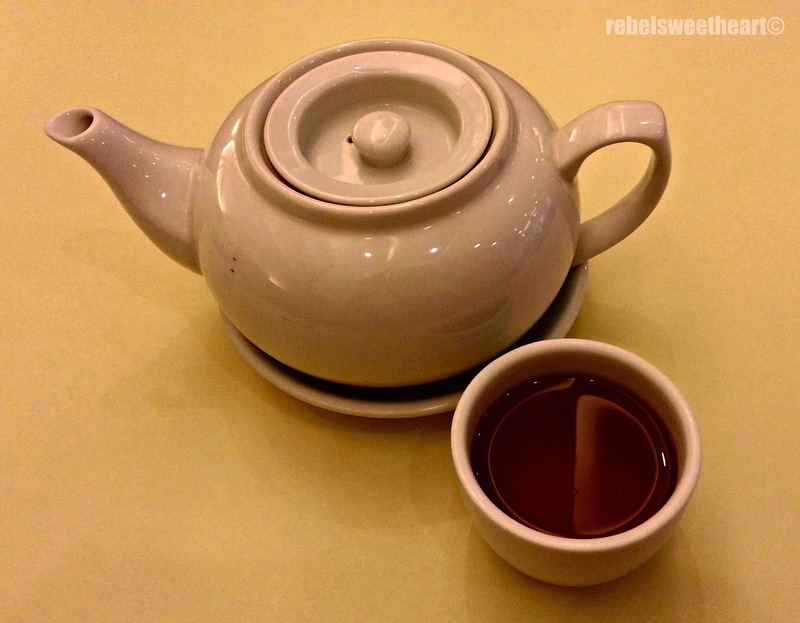 And like most Chinese restaurants, they served us a complimentary pot of their house tea before our meal. 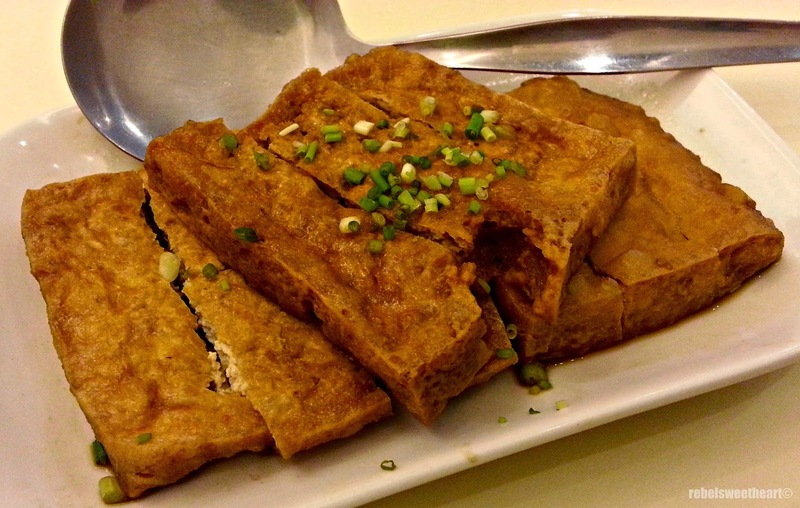 Hap Chan has extensive food choices on their menu - dimsum, congee, soup, noodles, vegetables, and classic Chinese dishes. 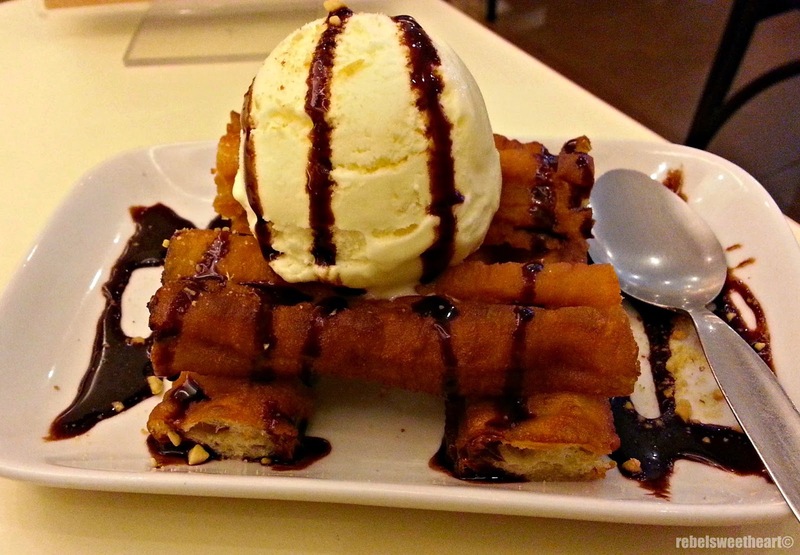 They also have a variety of drinks and desserts, set menus, and rice toppings. I ordered two bowls of rice toppings - one for the little man, one for me - instead of ordering rice and viand platters separately. The little man had Buttered Chicken - chicken pieces fried in butter, served with vegetables on the side. Yue likes anything chicken, so this dish passed his taste. 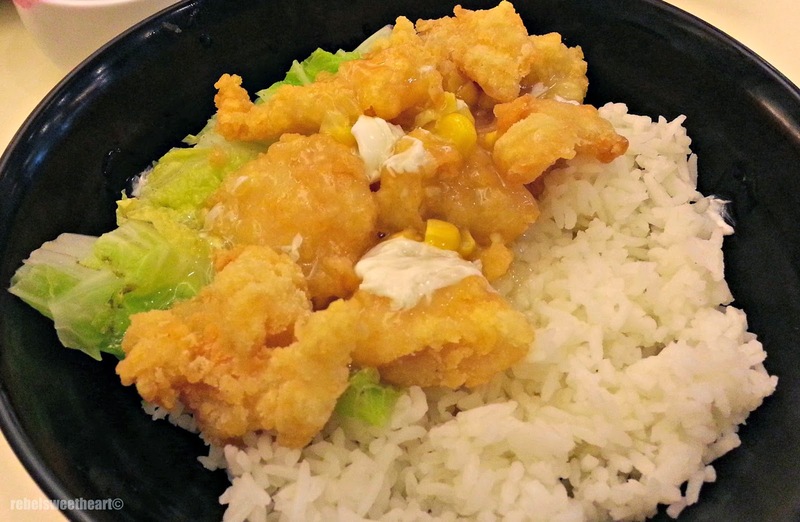 Fish Fillet with Corn Sauce, Php 130. I, on the other hand, had Fish Fillet with Corn Sauce. While I do appreciate the melt-in-your-mouth tenderness of the fish fillet, I can't seem to fathom the taste of the corn sauce. I was expecting it to taste like creamed corn, but this seemed like it was simply drizzled with Knorr's Crab and Corn soup. 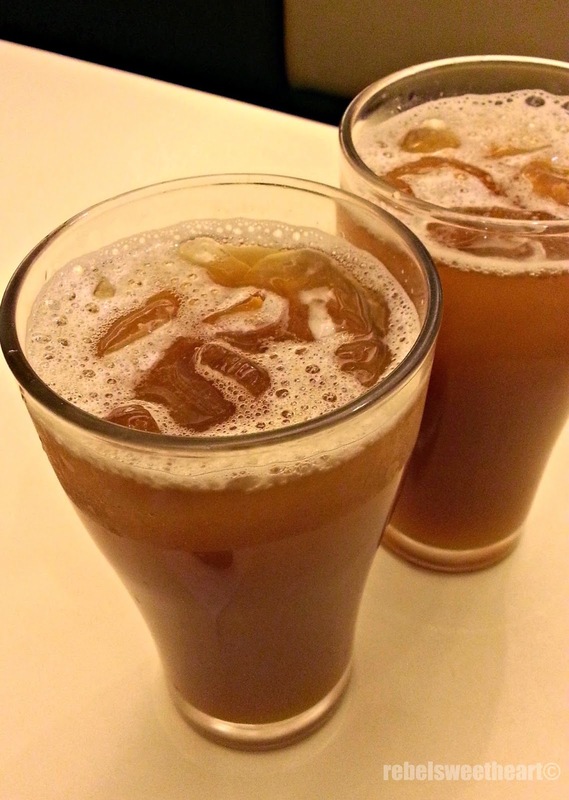 Hong Kong Lemon Iced Tea. Good thing I made the right choice of ordering a separate plate of Soyed Tofu. Soft tofu soaked in light soy sauce, this simple yet flavorful dish made up for the somewhat bland taste of my fish fillet. 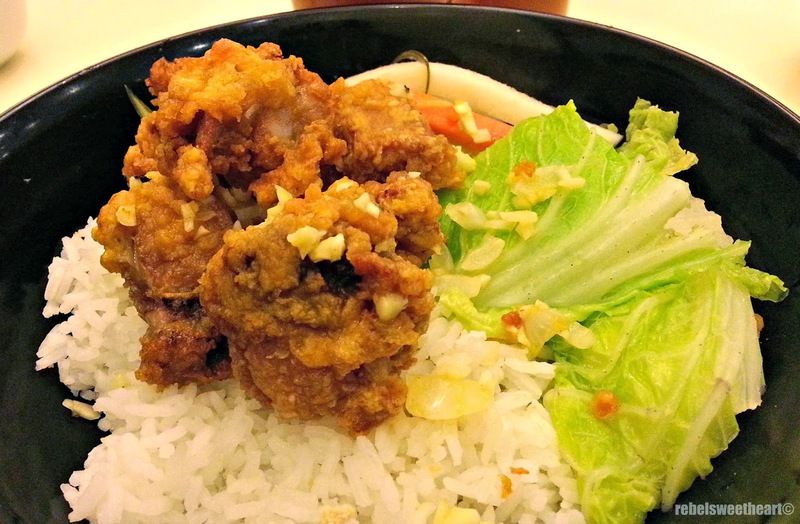 By the way, rice toppings come with a free glass of Lemon Iced Tea and a small bowl of Ho To Tay soup. Not bad for Php 130 per order, eh? 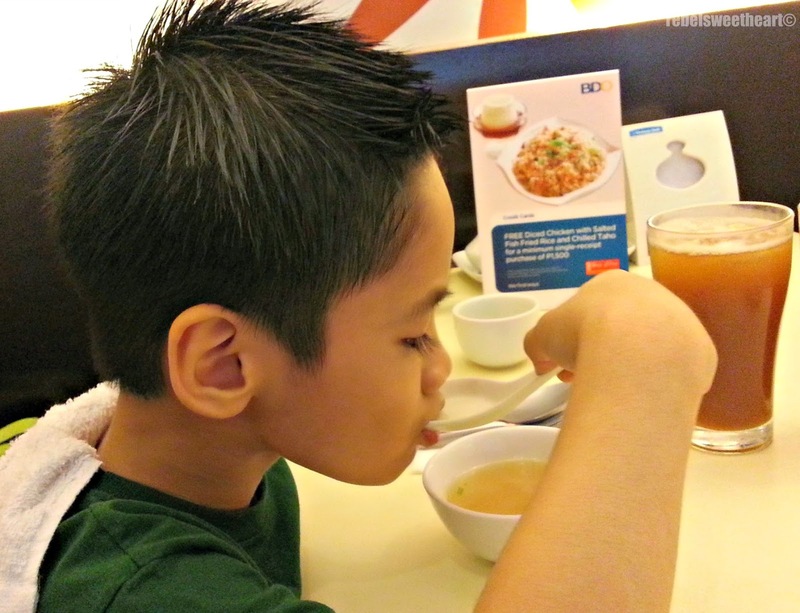 The little man loved the soup a lot. He even asked for a refill, much to my surprise. Haha! Chilled Taho with Sago, Php 45. I ordered Butchi, but here's what they served me instead - Bichu ala Mode. Their Butchi is one of the reasons why I wanted to eat at Hap Chan today (I've been craving for Butchi since last week), but alas, our waiter wasn't paying attention and mistook butchi for bichu. Bichu ala Mode, Php 75. I could have refused this bichu and demanded for my butchi, but since the waiter was very apologetic, I let it pass. I shared the ice cream with Yue, and had the bichu wrapped for take-away. Despite the order mix-up and my issue with the corn sauce, I can't say the dining experience was bad. 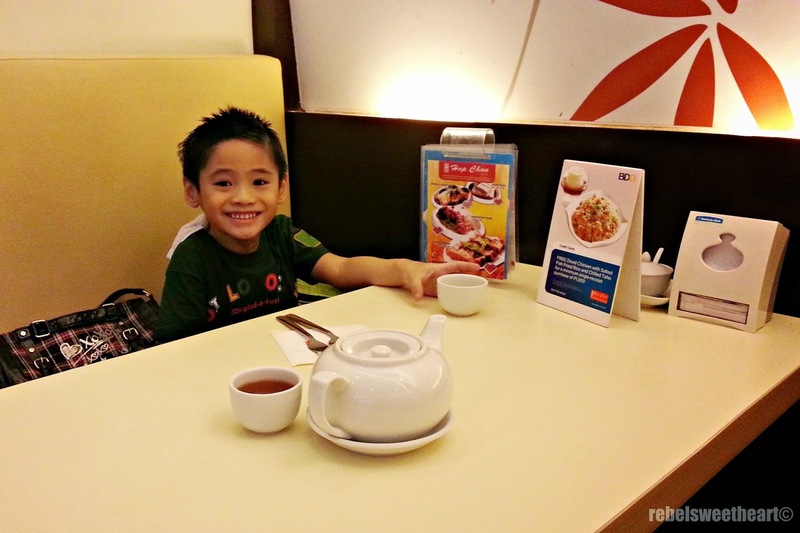 Mostly because the little man enjoyed his food at Hap Chan. Halfway through our meal, he was telling me that he'd like to eat at this restaurant again and try the other chicken dishes. Haha! Here's hoping there won't be an order mix-up next time we visit! Congratulations to you and your hubby! I love how you're celebrating this special moment with your little one, despite the distance from your husband, I'm pretty he appreciates that a lot. 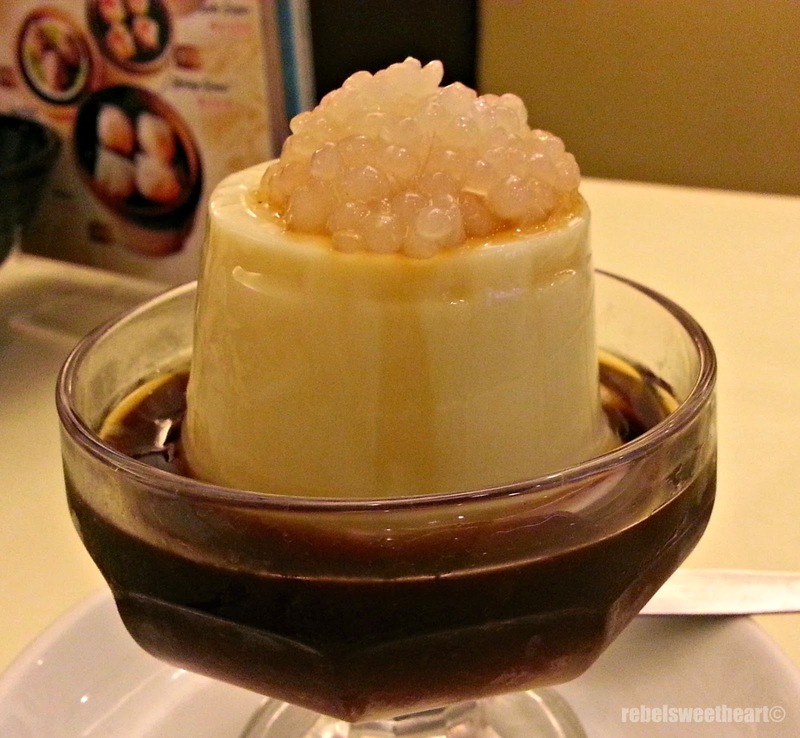 That taho with sago looks absolutely delicious. It's been years since I had one. Maybe almost 10 years! Insane, right? Congrats! :) its 21 years for us this year. Time flies! Looks like you guys had a great time food looks good! Sometimes you get an incorrect dish and it is actually better then what you had already ordered! It has happened to me. I am glad your son enjoyed his meal and wants to return to that restaurant for more! You can celebrate your anniversary when your hubby gets home! Happy Anniversary and awesome place to go. The food looks amazing. Thanks for sharing. Hoping next trip back there will be great. 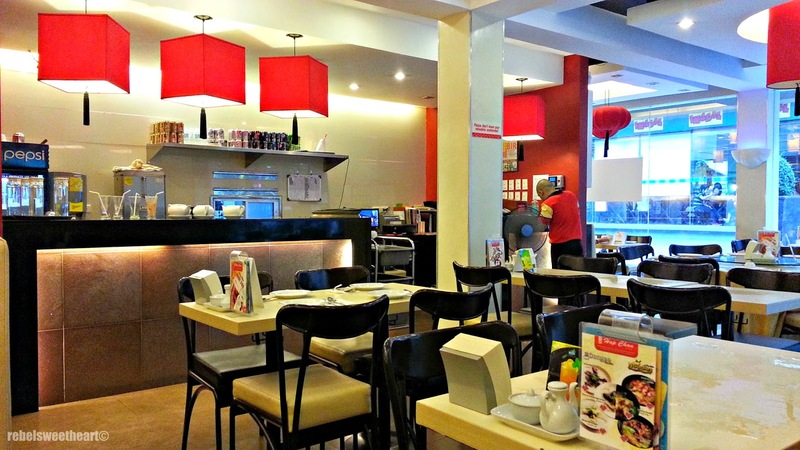 Their Ultimart branch looks nice, it actually looks better than their branches here in Manila! Good value for money! That's sweet that you and your son celebrated your anniversary. The dessert looks good! Will give Hap Chan a try. Happy Anniversary! I have been married about 1.5 years now. It's crazy how time flies. Of course, 11 years is quite HUGE. And what a delightful place you chose to celebrate it. Happy Anniversary to both of you! May you have more celebrations to come. what a sweet gesture for your Hubby love. 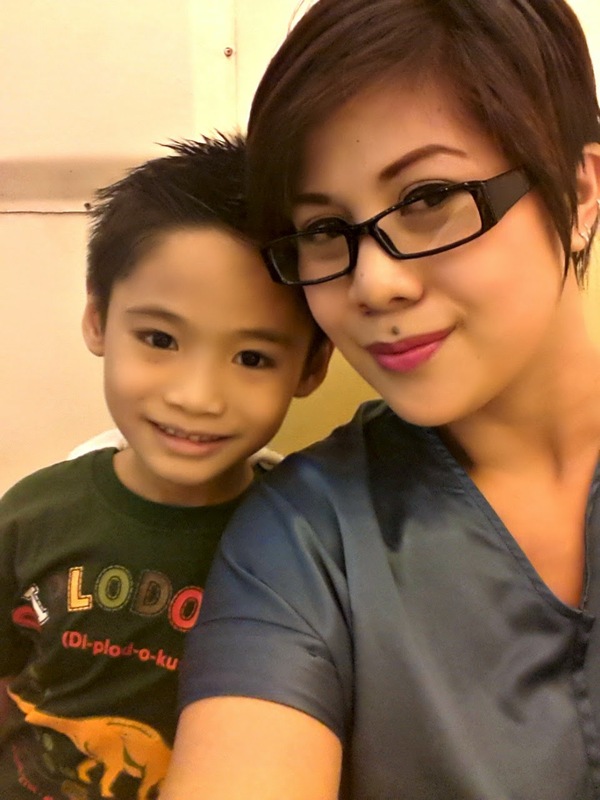 I never knew he is OFW. Which country?